Some say that coffee is life, and who are we to argue with that? Coffee is drunk by millions of people every day to help boost energy. But is it actually good for you? For years, doctors spoke of the damage coffee could do to the heart, and even said that it could stunt children’s growth. These theories have since been proven to be untrue, but how healthy is coffee? In this article, we’ll take a look at some of the pros and cons of drinking coffee. At Nature’s Energy, we know how much people struggle to keep up with the demands of every day. Because of this, we’ve created products with vitamins to boost energy and to provide much-needed vitamins and minerals to the body. Try our all-in-one liquid nutrition supplement, Liquenergy, which is made from plant-sourced minerals. Liquenergy is made to be absorbed by the body easily, and is a rich blend of natural ingredients. Shop online now! Are you a coffee drinker? Here’s what you need to know about its effects on your body. Coffee drinkers have a small percentage less of a chance of developing type 2 diabetes than those who don’t drink coffee. Some of the ingredients in coffee can affect hormones that drive your metabolism—even when drinking decaffeinated coffee. Coffee isn’t exactly the fountain of youth, and you’re probably not going to end up looking 10 years younger if you drink it! However, research has linked coffee to reducing inflammation in the body, which is a huge factor in the body’s aging process. It can also reduce your metabolic processes responsible for aging. Some studies have shown that it can decrease the chances you’ll have dementia, Parkinson’s, and Alzheimer’s too. Coffee is a stimulant that increases your rate of metabolism, which can help you burn fat quicker. Furthermore, it can increase your energy and increase your athletic performance to give you that extra boost to do more crunches or take another lap around the block. Your liver works as a filter for impurities in your blood, and it plays a crucial role in regulating other processes in the body. If you drink alcohol, medications, or have a disorder that affects the liver, it might not be functioning as well as it should be. Coffee supports the liver, and can actually work to prevent cirrhosis of the liver and liver cancer. Antioxidants are instrumental in regenerating the cells, fighting free radicals, and providing an overall health boost. We mentioned earlier that antioxidants play a role in your rate of aging, too. Coffee has high levels of antioxidants, and has even more than some veggies and fruits do! All this said, as much as we love coffee, there are a few downsides that we need to cover. Your body loves coffee, no doubt. But you have probably experienced caffeine withdrawal when you ran out of coffee. The symptoms of caffeine withdrawal can including shaking, headache, irritability, nausea, and having zero energy. Coffee is acidic, which means it can wear on the lining of your stomach. Some find that coffee gives them pretty bad heartburn. This can happened because of the acidity of the coffee itself, but also because it stimulates the digestive juices in your stomach. From time to time, some of us appreciate having a little more help keeping the bowel movements regular. However, some of us don’t appreciate this side effect of coffee at all. It can even cause diarrhea, which can be dehydrating (on top of the diuretic effect coffee has in the first place!). To be clear, we’re not saying that coffee causes stressful things in your life! But as we mentioned earlier, it does give you a bit of a boost in the energy department, and it’s in part because it stimulates the body to release cortisol, which is the hormone released when you’re under stress. It raises your heart rate and can make you jittery. If you’re already feeling quite a bit of stress, coffee can contribute further to your “fight or flight” response. What comes up must come down, and if your energy peaks because of coffee, it’s got to come down, too. Some people feel fine when the caffeine lets down, but others feel even less energy than they did prior to drinking the coffee. Coffee itself is only a few calories. The problem arises when you add a bunch of ingredients to dress it up. Some people add a lot of creamers, sugar, and other ingredients, which can quickly add up. This can cause some coffee drinkers to gain weight. If you do love your coffee, look for healthier alternatives to adding flavor and try to avoid using sugar when possible. 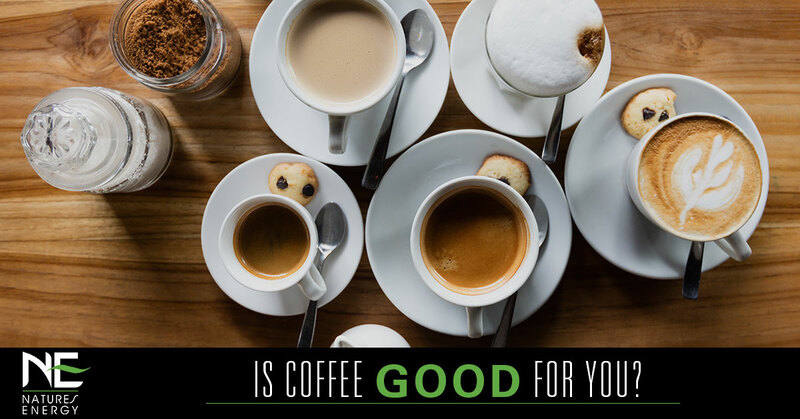 The choice of whether or not you drink coffee is up to you, and there is certainly strong evidence that it can provide some health benefits. If you feel that it is negatively affecting your health, there are alternatives that could be better options—or you can opt for very small portions of coffee if it brings you joy! If you’re searching for an energy boost supplement that won’t add unnecessary sugar or an energy crash, we recommend trying Liquenergy by Nature’s Energy. It’s packed with minerals and vitamins to boost energy, and is all-in-one liquid nutrition. It comes in liquid form so you won’t have to swallow a handful of tablets to get your nutrition, and the nutrients are easily absorbed by the body. For the nutrients and the energy that your body needs, shop for Liquenergy now. Nature’s Energy carries it exclusively, and it has a lovely orange, mango, and peach flavor. It contains no caffeine but will help you keep your energy going. Shop online for Liquenergy by Liquid Energy today!